We just finished our second workshop focusing on Working with the iPad. We compiled our favorite apps and strategies. We took a couple of moments to ask the facilitators about their favorite apps. "My favorite storage app is Dropbox at home and OneDrive for work. I like how Dropbox integrates with all of my favorite apps and it syncs to my computer. I like OneDrive for syncing my work in Microsoft Office." - Adam Nemeroff, Instructional Designer. Here are links to all the apps we picked for storage. Tell us what you like best in the comments! Here are links to the other productivity apps we demonstrated. Let us know what you like in the comments! 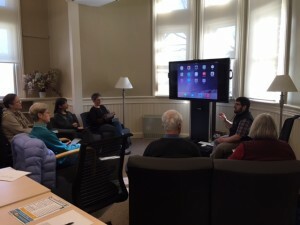 We demonstrated several apps tied to note taking and digitizing your thoughts. Check out the apps and let us know your thoughts! If we forgot anything, let us know what your favorite app is in the comments section!